The Burns and Allen Show was a situation comedy series broadcast from 1929 to 1950 first on BBC, London, later CBS, and NBC. George Burns and Gracie Allen played themselves in this comedy. George and Gracie got married after years of performing together before they started the show. Elvia Allman starred as Gracie's friend Tootsie Sagwell. Mel Blanc played the postman. Margaret Brayton was Mrs. Billingsley. Burns and Allen were first discovered by the British as they were doing a vaudeville tour in England. The Brits welcomed and loved them, particularly Gracie. After airing on CBS and NBC, the Burns and Allen Show was a national sensation in the early 30s and remained fairly popular throughout the 40s. In fact, Burns was considered "one of the funniest men alive, " while Gracie "one of the five most famous women in America." The Burns and Allen Show features the home life of a couple in show business. George works for a radio program as a performer. Gracie Allen plays a hilarious scatterbrain and sometimes acts as George's agent. Her lines are the funniest and wackiest in a non-sensical manner and they carry the weight of the show. Gracie has a singular ability to deliver her stunts and gags in the dumbest yet most innocent way. 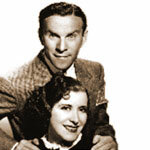 Gracie's skits were mostly handled and very often written by her husband George Burns. George was instrumental in advancing Gracie's career and was happy to see Gracie in the limelight.